•The LAT has an article about the sexual assault in the Red Line’s Sunset/Vermont station in East Hollywood last week. The LAPD issued a release yesterday and Metro posted a statement on The Source today. Related: crime stats for the Metro system are reported to the Metro Board of Directors every month. Here is the latest report. •Eleven groups have signed a letter urging Metro to invest in a world-class bus network as part of its NextGen Bus Study to restructure the bus system, reports Streetsblog LA. Specifically, the groups call for Metro to possibly increase bus operations funding and to publish a list of high-priority areas where bus lanes and other bus priority projects could be built on local streets. A couple things to know: Metro’s Measure M sales tax is funding three bus rapid transit projects that may incorporate bus lanes, etc. The trip: Vermont Avenue, an east-west line across the northern San Fernando Valley and a North Hollywood to Pasadena line. Here’s the project page that includes more info about all three. 10) Will the NextGen Bus Service Plan be constrained to the 7 million service hours currently available? The initial assumption of the NextGen Bus Study is to develop a service plan within the range of 7 million service hours, plus or minus 10 percent (6.3 million to 7.7 million hours). However, this does not preclude Metro from developing a service plan that exceeds this range should the benefits justify any tradeoffs to other Metro projects and programs. In other words, stay tuned. NextGen is expected to release service concepts for the bus system later in the year. •As reporters like to say, the city of L.A.’s request for scooter location data has ‘raised concerns’ — in this case about privacy, even thought the data is stripped of sensitive info, reports SFGate. LADOT (the city’s transportation agency) says the location data will help manage scooters and ensure companies are abiding by agreements. Others — in this case companies in the scooter biz — aren’t crazy about sharing with government. Thoughts? •A new presentation and FAQ on the Crenshaw Northern Extension project are here. This is a much-anticipated project not scheduled to begin construction until the 2040s although there are definitely efforts underway to try to accelerate it. 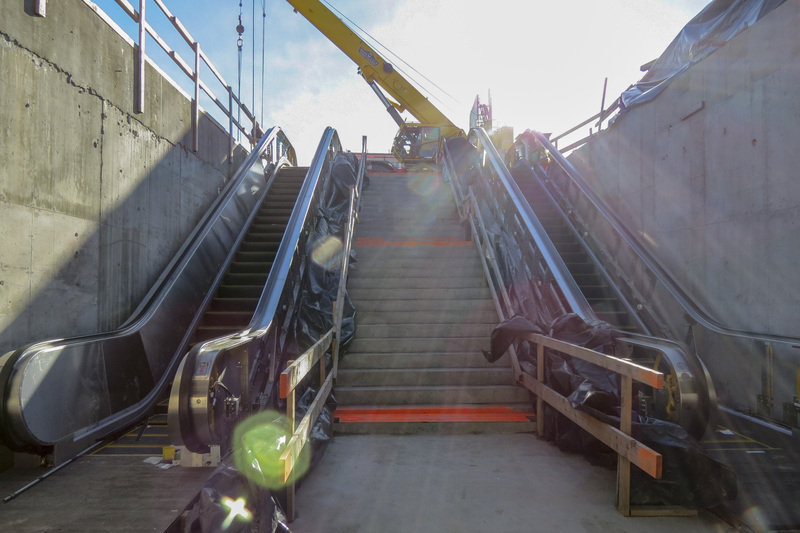 Art of Transit — two recent pics of the Leimert Park Station on the Crenshaw/LAX Line, which is scheduled to open in 2020. Only a single track with a single side platform? This view is just south of the station and the photo only shows one of the two tracks! It’s a middle platform. 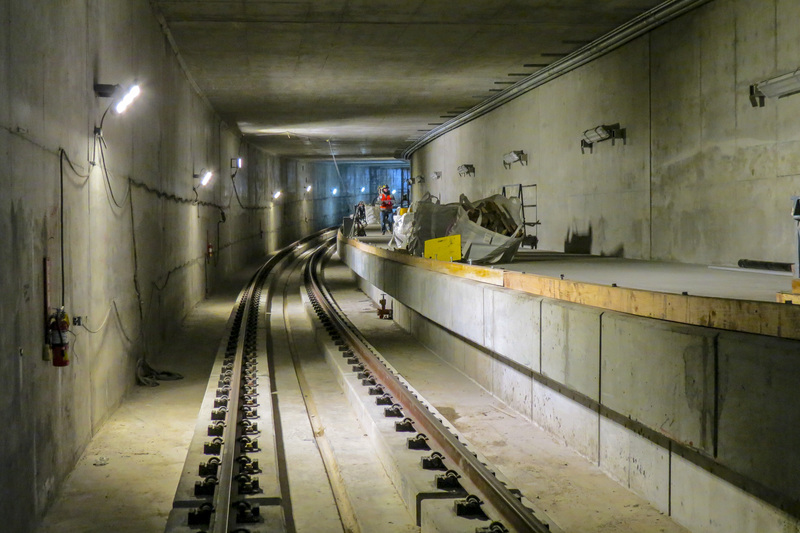 The photo shows the emergency exit walkway as the tracks head to/from the tunnel portal.